Our Mission is to apply our professional capabilities with a holistic approach for the happiness of clients, through values and social commitment. 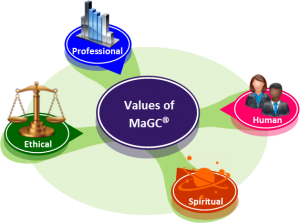 MaGC constantly aims at establishing, measuring and upholding the four management values for continuous and enhanced working relationship with clients and a satisfactory and motivated workplace. Spiritual values, the highest of all values, elevates an individual, to such an extent that there is no difference between the individual and his work. We at MaGC, strive to retain these values in everything we do! 3. To complete assignments within timelines committed and within budget. 3. To deliver training programmes deploying well qualified and competent trainers.